Let me describe this coffee cake to you. 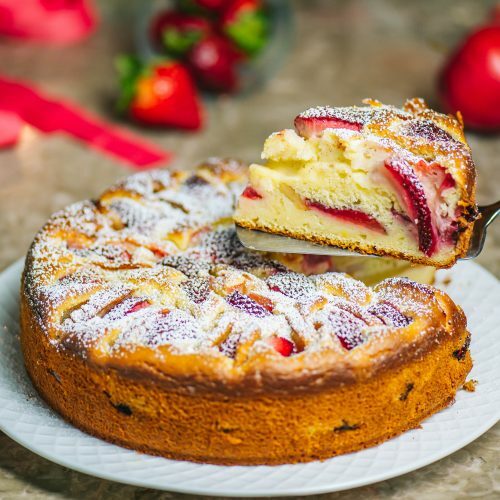 The sponge cake itself is very, very moist and the fruit bits that are inside it burst with flavor with each bite. If you’ve been following my blog, you know that the combination of apples and strawberries is a match made in heaven for me. Once you try this cake, you will know why! I also like to slightly pre-cook apples for this particular recipe. I like that the apples lose some of their crunchiness and become pleasantly soft when eating it. This method will also add to the overall moistness of the cake. One downside of this apple strawberry coffee cake is that it is quite addictive! I will be lying to you if I say one cup of coffee or one slice of this cake will be enough. It certainly is not for me and that’s how I get in trouble. Wash, cut in half, core the apples. 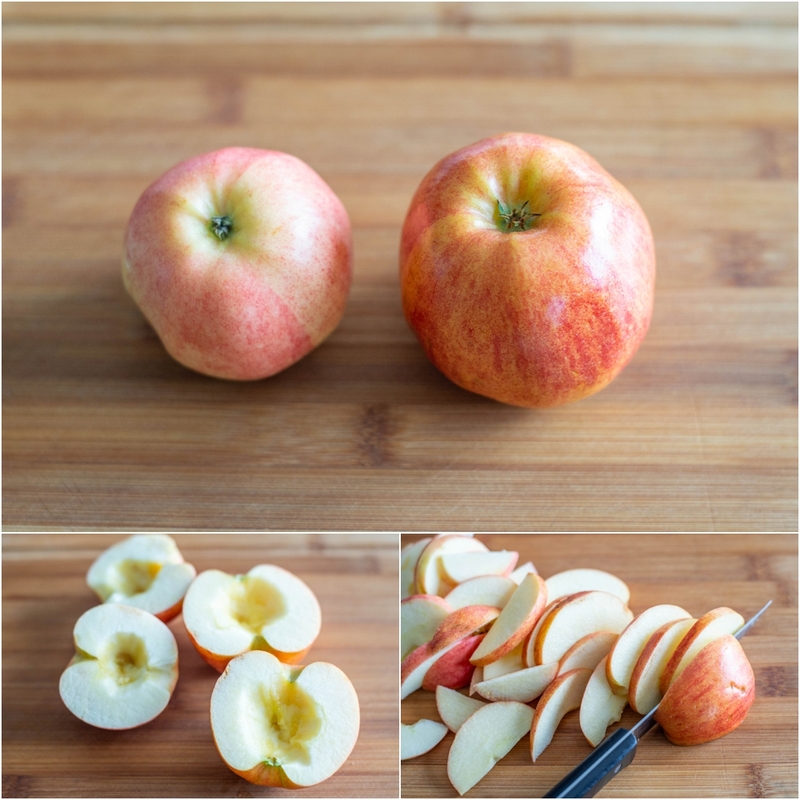 Slice the apple halves in half moons that are about 1/8 inches thick. 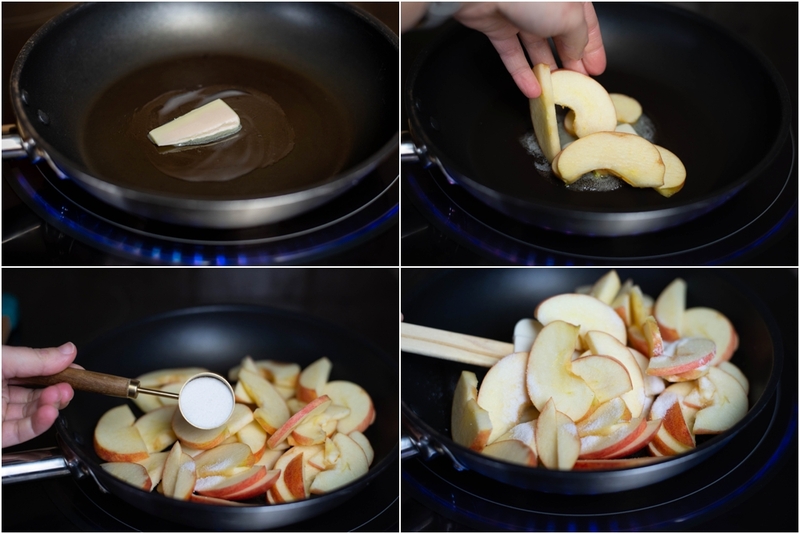 In a small skillet melt 2 tsp butter and place the apples in there. Keep the heat at medium-low. Add 1 Tbsp sugar and give the apples a mix. The apple slices will start releasing some water and slowly cook down. Make sure not to burn them. If the heat is a little too high, by all means, lower it. The entire process should take about 8 minutes. *HINT: Cooking apples do not need supervision. You can start cutting the strawberries while the apples are cooking. 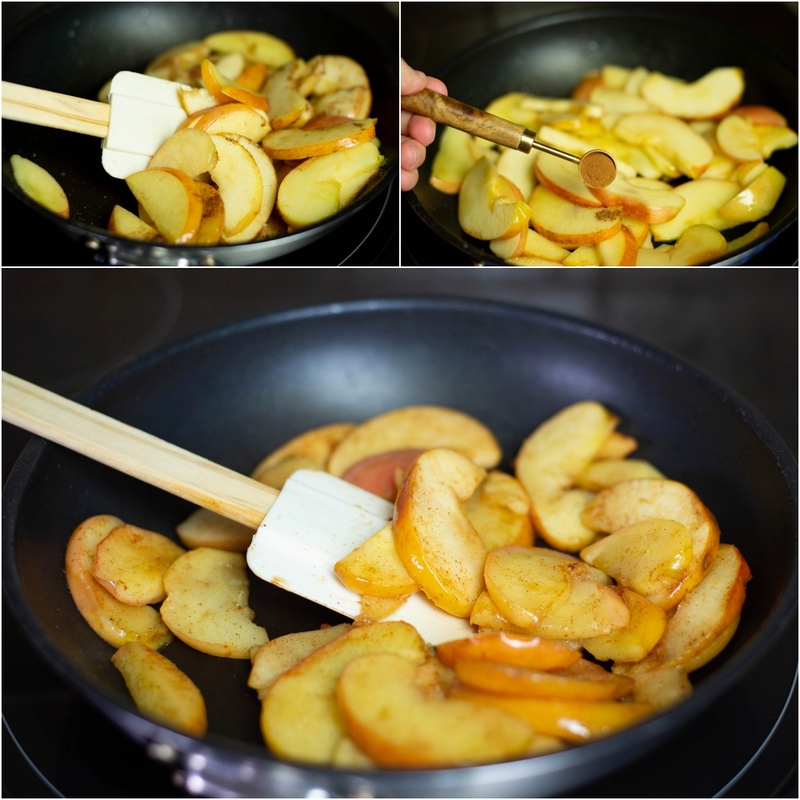 Once the apples have cooked down some (5-6 minutes), add cinnamon and stir the apples gently. At this point, you want to be careful with the apple slices since they are a little fragile. Cook for another 2 minutes and turn the heat off. Wash, dry, remove the green parts and quarter the strawberries. 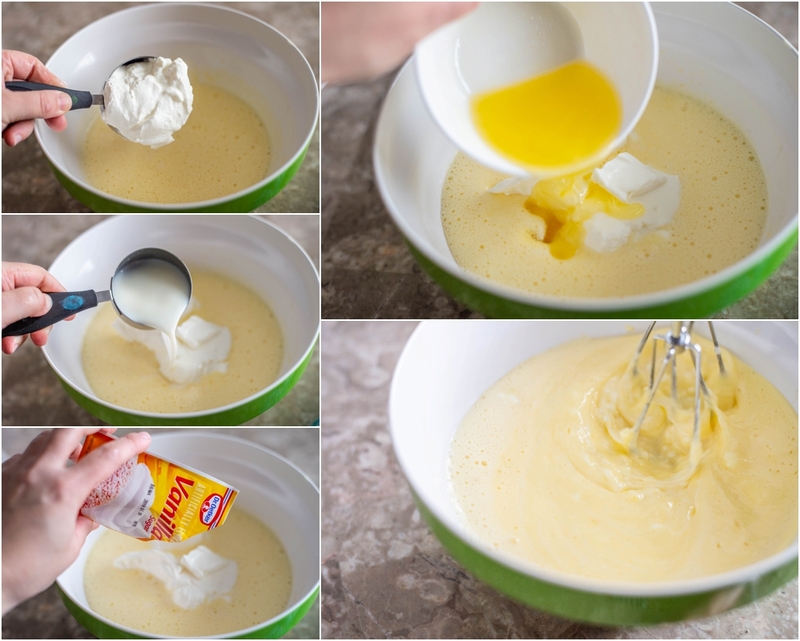 In a medium bowl whisk eggs with 3/4 cup of sugar. Whisk until eggs turn pale yellow and mixture thicken a bit. Add sour cream, melted butter (room temperature), milk and vanilla into the egg mixture. Give it a whisk on low speed until everything is incorporated well. Add flour into the bowl, add salt and baking powder on top. 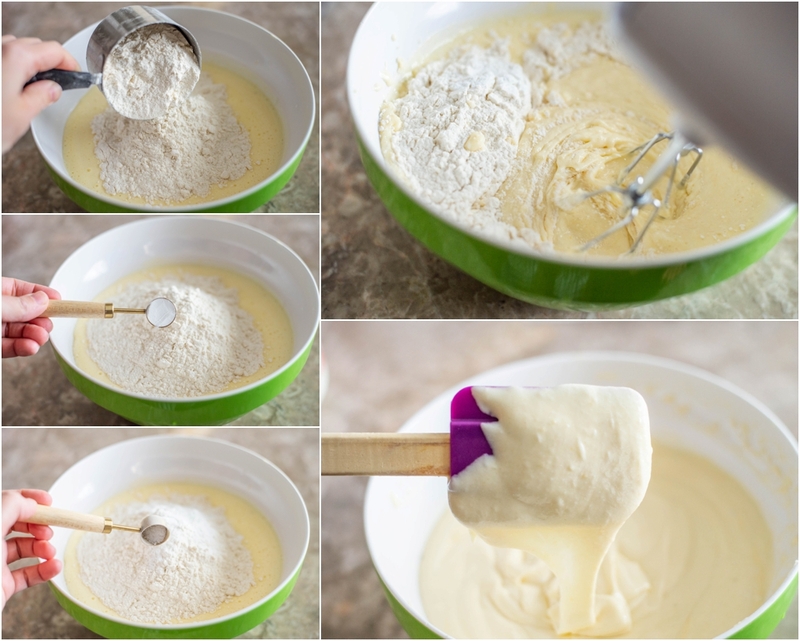 On low speed of the mixer whisk the batter until flour is incorporated and the mixture becomes smooth. Both the strawberries and apple slices will be used in 1/2 batches, including the batter. Visually dividing them into two will be enough. Line a 10-inch springform pan with parchment paper. 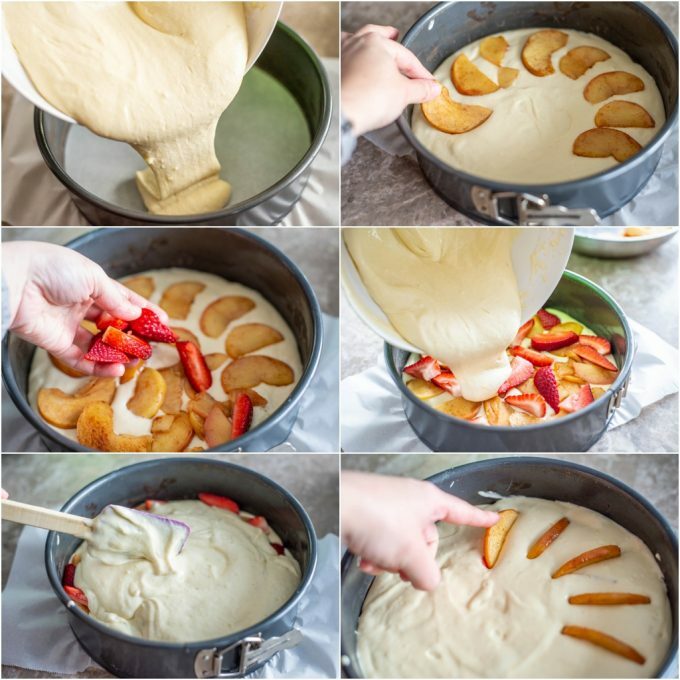 Add half the batter into the pan, spread half of the apple slices and half of the strawberries on top of the batter. Pour over the rest of the batter on top of the layered fruits. 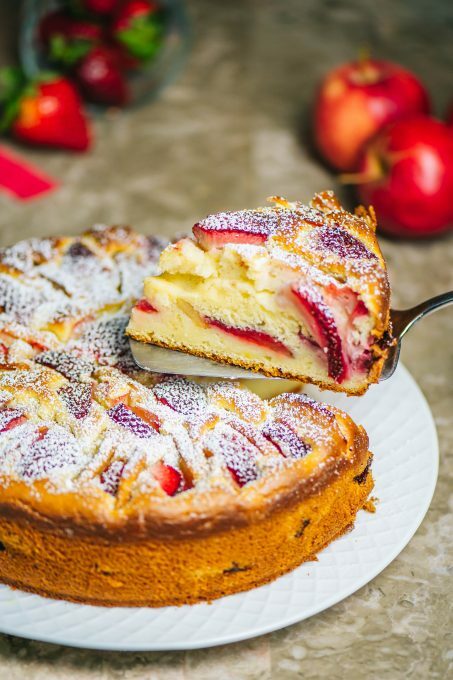 Artfully and evenly spread the rest of the fruits on top of the batter. Well, doesn’t have to be super artful :) Whatever rocks your boat at that moment. Bake the cake in the heated oven for about 45-50 minutes. 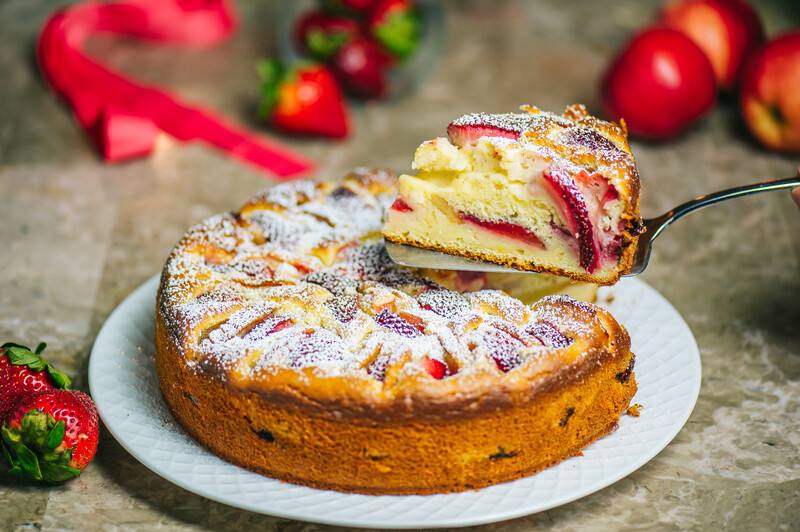 If you are noticing that the top of the cake might be getting too dark for your liking, place an aluminum paper on top of the cake towards the end of the baking process. This will ensure that the cake is not burning, but the inside of it is getting an even bake. While apples are cooking wash, dry, remove the green parts and quarter the strawberries. To save time, start prepping strawberries while apples a cooking.